By the same token, the male art of calligraphy has been brought into a world of female experience from which it has traditionally been excluded. Also, by choosing to use a number of women, I subvert their imposed silence. These women “speak” through the language of femininity to each other and to the house of their confinement, just as my photographs have enabled me to speak. Through these images I am able to suggest the complexity of Arab female identity – as I have known it--and the tension between hierarchy and fluidity at the heart of Arab culture. As an artist now living in the West, I have become aware of another space, besides the house of my girlhood, an interior space, one of "converging territories." I will always carry that house within me, but my current life has added other dimensions. There is the very different space I inhabit in the West, a space of independence and mobility. It is from there that I can return to the landscape of my childhood in Morocco, and consider these spaces with detachment and new understanding. When I look at these spaces now, I see the two cultures that have shaped me and which are distorted when looked at through the "Orientalist" lens of the West. 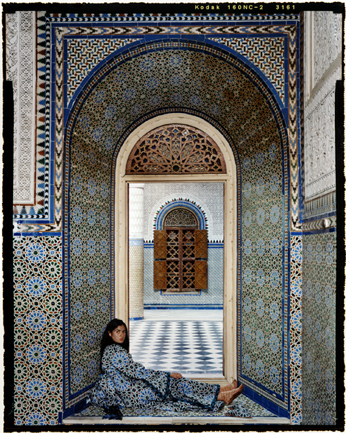 This new perspective has led me in my most recent photographs to situate my subjects in a non-specific space, one which no longer identifies itself as a particular house in Morocco, but rather the multivalent space of their/HER own imagination and making. In these images, the text is partly autobiographical. Here I speak of my thoughts and experiences directly, both as a woman caught somewhere between past and present, as well as between "East" and "West," and also as an artist, exploring the language in which to "speak" from this uncertain space. But in the absence of any specificity of place, the text itself becomes the world of the subjects – their thoughts, speech, work, clothing, shelter, and nomadic home. This text is of course incomplete. It involves the viewer as well as the writer in a continual process of reading and revising, of losing and finding its multiple and discontinuous threads. Similarly, figures of the women in the photographs can only be gathered and informed by multiple visual readings. As you can see, the Orientalist tradition is more directly called forth, and played with, in my most recent photographs than in earlier ones. But again, this is only a matter of emphasis, yet another layer in the palimpsest of readings I hope to evoke in the viewer. Ultimately, I wish for my work to be as vividly present and yet as elusive as “woman” herself -- not simply because she is veiled or turns away – but because she is still in progress.